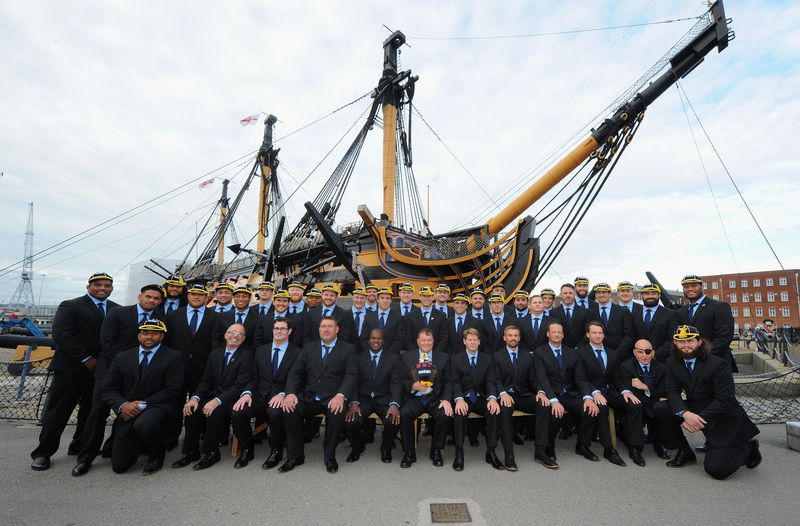 The USA Rugby Squad on the gang plank of the HMS Victory. “We’re keen to make the most of this,” USA Eagles Captain Chris Wyles told those gathered Sunday at the Rugby World Cup welcoming ceremony for the American team. In his speech to the audience at the HM Naval Base Portsmouth, Wyles called participation in the World Cup a once-in-a-lifetime opportunity. Each member of the team received a tournament cap and participation medal and the 31 players and their coaches posed for photos in front of the HMS Victory, Lord Horatio Nelson‘s ship in his defeat of the French and Spanish fleet during the Napoleonic war in 1805. The Eagles play their first RWC match on Sunday, Sept. 20, against Samoa at the Brighton Community Stadium in Brighton. The U.S. team is in Pool B with South Africa, Scotland, Samoa and Japan. PORTSMOUTH, ENGLAND – SEPTEMBER 13: The USA Eagles in front of the HMS Victory.